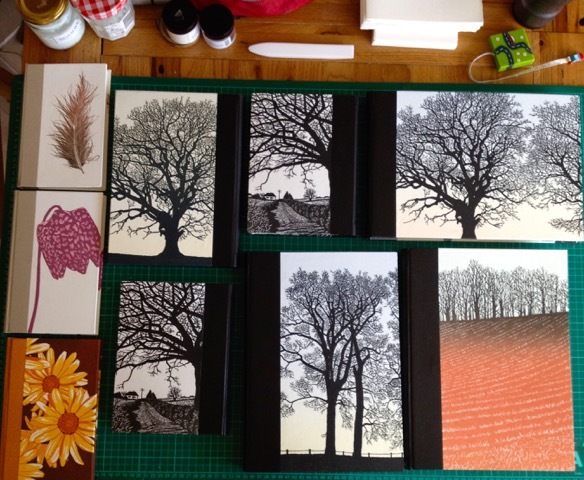 I’m in full book production, trying to build up some stock for open studios in September, the Devon Guild Christmas sale and other sales I’m doing in the autumn. I’m testing different size books, different coloured backcloth, and different prints. I like the feather on the cover of the little book with the light brown bookcloth spine, but not so sure about the other two smaller ones on the end. Not too keen on the flower ones. The feather one is splendid, and the tree ones are just amazing. Love your trees!